This fresco is located on the south wall among frescoes devoted to the Life of the Virgin in the Baroncelli Chapel. 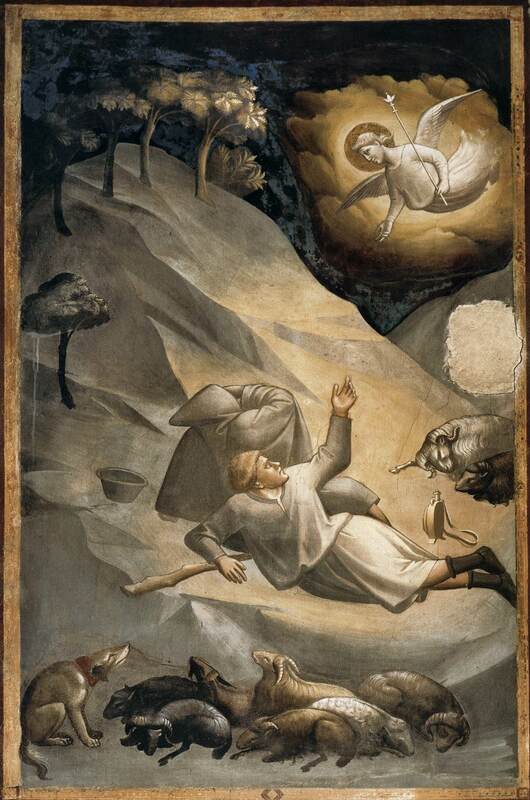 This nocturnal scene presented in a unique way: the golden yellow glow of the cloud that surrounds the hovering angel bathes the shepherds and their resting place in a bright light that even reaches the trees that crown the mountain peak, while the remainder of the pictorial space is filled with semidarkness. Although the light source is a supernatural one, it produces a natural effect. Taddeo Gaddi (c. 1300 - c. 1366), a Florentine painter, was a pupil of Giotto's and one of his most inventive followers. He worked alongside the master for twenty-four years, and in 1347 he headed a list of the best living painters compiled for the purpose of choosing a master to paint a new high altarpiece for Pistoia Cathedral. Today, he is best known for the works painted for Santa Croce, Florence: notably the frescoes devoted to the Life of the Virgin in the Baroncelli Chapel (finished 1338).